Discover what the average tuition charge is for U.S. colleges, and how Bowie State University compares. Find out how tuition and fees at Bowie State University compare to other U.S. colleges and universities and learn how to properly prepare for possible tuition increases. How Does Bowie State University Measure Up To Other Schools? The following table outlines how Bowie State University measures up to other schools nationally, regionally and by state. 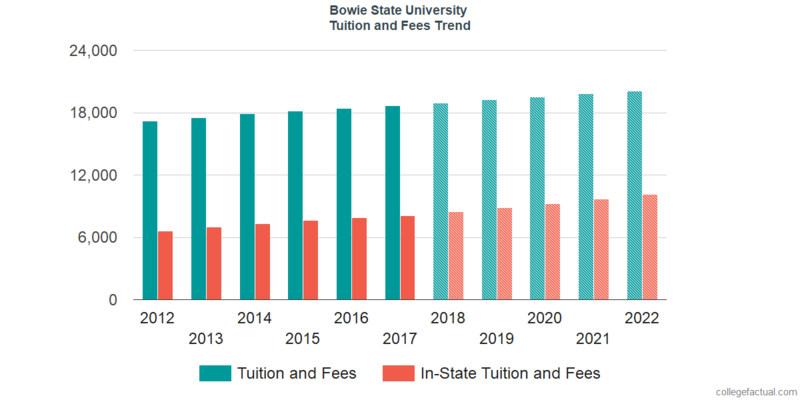 Bowie State University tuition and fees is reduced dramatically for residents of Maryland. For in-state students, tuition and fees is set at $8,064 for the 2017 - 2018 year, 56.8% off the price charged to out-of-state students. Tuition is $5,427 and fees $2,637. Bowie State University out-of-state students paid $18,653 in fees and tuition in 2017 - 2018. $2,637 was charged for fees, and $16,016 was tuition. Tuition and Fees for out-of-state students attending Bowie State University grew at an average yearly rate of 1.5% within the last 5 years. In the same time period, tuition grew by 1.0% and fees grew by 4.8%. Due to this, we estimate the cost of tuition and fees this year will total $18,937. For a two-year degree, we estimate tuition and fees will be $38,161 and for a four year degree to be $77,491. This does not cover additional charges such as room and board, transportation, and books. The following chart shows estimated upcoming fees and tuition which includes residency based discounts for undergraduates at Bowie State University. Due to inflation and other variables, the price of college is likely to grow every year. For this reason your final year of college could be much more than your initial year.